A classic tomato and egg dish with many variations depending on region, this is an easy and tasty supper dish or use for hearty breakfast/brunch. Pour a glug of olive oil into a deep frying pan or saute pan on medium heat. Add onions and let fry for a few minutes, until lightly softened. Stir occasionally. Add red pepper and fry until lightly softened. Add garlic and chili if using, and fry until lightly browned. Add tomato paste to the pan and stir, letting it brown slightly. Add chopped tomatoes, followed by water, paprika, cumin and salt. Stir until all the ingredients are well integrated, and then cover and let simmer on a low flame for about 10 minutes, until tomatoes are softened and beginning to fall apart. Lift the lid and stir occasionally. Once tomatoes are cooked, remove lid and stir again. Taste and adjust seasonings. Make sure the sauce is more or less level in the pan. 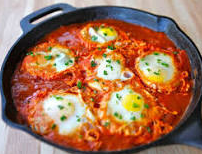 Add the eggs: Using a spoon, make a well in the surface of the sauce. Crack an egg into the well. Using the spoon, arrange the whites and surrounding sauce as necessary so that the egg yolk is below the surface of the sauce. Repeat for the remaining eggs. Cover and let simmer on a low flame until the egg whites are set, between 5-8 more minutes. The yolks should be covered with an opaque film when done. Remove the lid, sprinkle with chopped parsley and serve immediately. If the shakshuka sits for too long, or is left covered, the egg yolks will become solid.